Todd Helton has agreed to autograph a LIMITED number of the official Career Tribute Bat created in honor of his years of leadership and professional success with the Colorado Rockies. 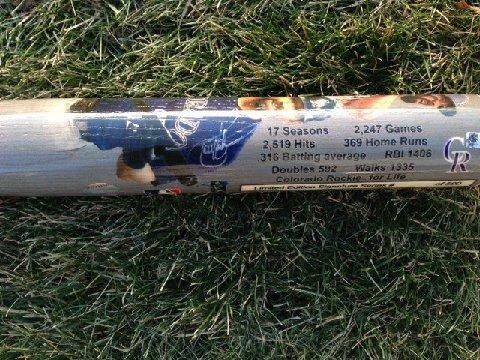 This is the same full-size bat offered as a tribute to Todd Helton's career. The wrap-around photography features the player, includes a list of his career statistics and a facsimile signature. 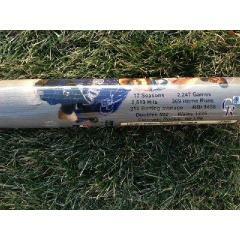 This bat honor's one of the game's class acts and would look great displayed on any wall in the home or office of every Rockies fan or collector of memorabilia. THIS BAT WILL INCLUDE THE AUTHENTICATED AUTOGRAPH OF TODD HELTON - in addition to his final career numbers. Due to the Limited Edition status of this bat we must charge your credit card for the full amount immediately upon taking your order. This policy ensures we reserve a piece of the series for you. Order early to obtain a low number. This bat is not game used. Please allow 4 to 6 weeks for delivery.